Lowan Shire (1875-1995) in north-western Victoria was created on 31 December 1875. It comprised an area of 6970 sq km, extending from the South Australian border to Dimboola. Its northern and southern boundaries were near Ouyen and Mount Arapiles respectively. It thus included the western parts of the Mallee and the Wimmera regions, the Big Desert and the Little Desert. Its first administrative centre was Dimboola. Dimboola was the original settled area and the far flung shire was more or less appended to it. 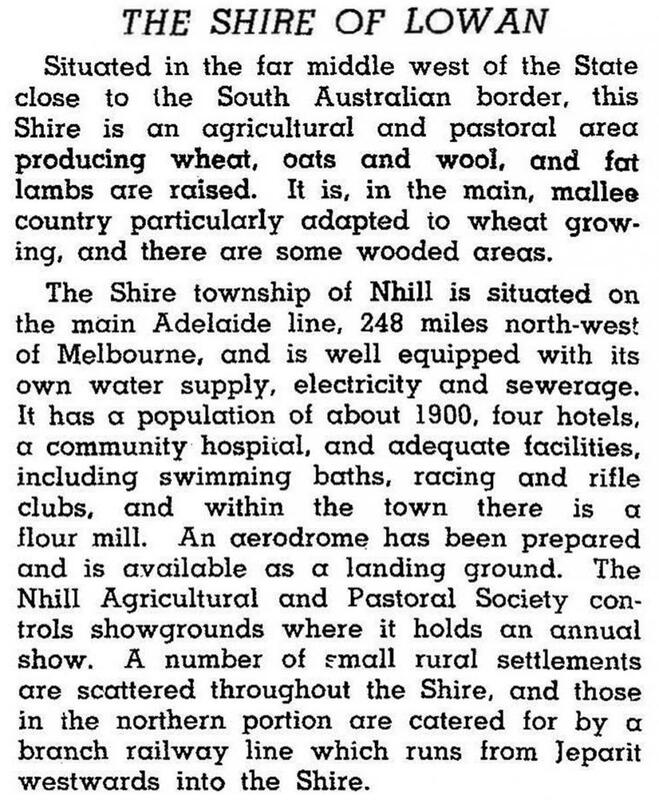 As settlement of the Wimmera and Mallee progressed, towards Nhill at first, Dimboola shire was severed in 1885 and Nhill became the Lowan shire’s administrative centre. In 1891 the western part of Lowan shire was separated, becoming Lawloit shire, centred on Kaniva. Severances southwards and northwards occurred in 1894 and 1911, when Lowan assumed its final shape and area of 2861 sq km. The shire’s northern part was thinly settled. Settlement was clustered around Nhill, the railway line (1887) through Nhill to Kaniva and beyond, and the land north-west of Nhill to Yanac. There was also a railway line westwards from Jeparit to Yanac (1912-mid-1980s). The south of the shire was in the Little Desert, the best-known breeding area of the Lowan or Mallee Fowl, a ground-based bird which incubates its eggs in a large mound of heat-producing vegetation. The name was derived from an Aboriginal word describing the bird. In 1994 farming occupied 67% of the shire’s area. There were 148,600 sheep, 42,400 lambs and cereal harvests comprising 52,873 tonnes of barley and 83,585 tonnes of wheat. On 20 January 1995, Lowan shire and Dimboola shire were united to form Hindmarsh shire. Two thirds of the population in 1991 were in Nhill.